I am usually not drawing this stuff out. Mostly, I just imagine it, so all of this has much more utility if you are spatially oriented. By developing my intuition for a "standard" implementation, I am giving up flexibility for speed. This allows me to construct more complicated perceptions. In other words, I am increasing memory-complexity to decrease time-complexity for my reality simulation algorithms. To give some idea of the scope I am working with here: I am using all this to roughly simulate/model human history with economical-ecological-political-cultural distribution networks projected onto the surface of earth. Over vast spans of time, the dominate flows are constrained by geography, energy, climate, demographics, transportation, and agriculture. I have moved away from the cognitive functions in MBTI, so perhaps instead I can classify different forms of agency with inspiration from the big-5. Both ( do, link ) and ( describe, classify ) are tightly coupled to represent the space of possible "micro-actions". Micro-actions form links between territories, systems, links, and abstractions. 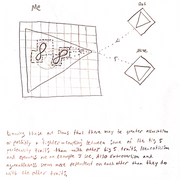 I used the big-5 dimensions by attempting to spit each of them into two opposing diagrams. 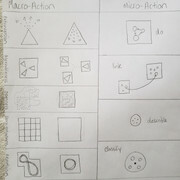 Each diagram represents a different "macro-action". These are rough associations and not definitive. I thought this exercise may help me to construct visualizations for different forms of cognitive bias later. Above is an attempt to represent myself with this language and the big 5. Your micro-actions seem similar to the cognitive functions in the mbti system. Maybe I will try to define one of those personality types with them. There definitely are some correlations in the big-5 dimensions. I will try to elaborate on some important characteristics below. Also, the micro-actions are similar to the functions, but I do think they are slightly different. Roughly, do ~ (Se,Ni) .. link ~ (Si,Ne) .. describe ~ (Ti,Fe) .. classify ~ (Te,Fi). I think the functions have a larger contextual load and cannot be recognized as easily, though. ( emit, receive ) Related to sound and taste layers. ( agree, disagree ) Related to intuition (sub-conscious motivations). ( open, close ) Related to taste layer. Interesting links to mess tolerance, disease control, immigration, tribal identity, anxiety, and PTSD. ( hold, release ) Related to color layer (holding values or goals) and impressions. This is related to my past comments on this forum about how wisdom is knowing when to cut (or hold a boundary). Also relates to how a topology is changed if cutting or gluing is involved. ( pivot, control ) Related to feeling layer. These actions could also be used to describe bipolar disorder, OCD, and some other mental health conditions. Last edited by daylen on Mon Apr 15, 2019 10:31 pm, edited 1 time in total. Your depiction of my tendencies is better. Maybe it depends on the combination of the primarily used* traits that determines the relationship among traits. Based on your picture I see many possible inter-trait relationships, but I don't know how to tell which are true or which are valuable, or if it means they form a complex system known as the mind and its best to leave it at that. Perhaps it is not useful to reconstruct the pieces, but it is better to use them separately as intended. It seems to me that the cognitive functions are good at explaining and predicting thoughts and behavior in series across time, at the least in form. I understand the Big 5 is good at explaining and predicting behavior, but when it is broken down and represented with context at an instant in time such as one of these pictures could do, does the Big 5 also explain and predict thought well too? What I am asking is how precise is it compared to cognitive functions? Another thought is with all of these dimensions and factors of influence for the traits as laid out above, a matrix could be formed from the functions of each dimension with respective factors and solved substituting the context into the variables with some program. This would be an approximation of consciousness, which seems like a step towards the AI thing. You could create a graphical output of this consciousness which would be cool and possibly akin to these figures. 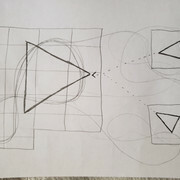 Interfacing context into the computer would be the hardest part, assuming these dimensions and factors are both consistent and complete enough. *Primarily used eg. disagreeable and not agreeable for me. What I keep in mind when drawing this stuff out is that any representation will be flawed. This stuff cannot be precise due to the complexity of what we are modelling. In physics, there is something called the three-body problem where a closed-form solution does not exist for all initial conditions, but an approximate numerical solution is feasible in some cases. The brain is the most complicated thing in the known universe, and systems with many brains are obviously even more so. We make many assumptions while navigating social situations to make calculations feasible. It is amazing that we can interact as well as we do, but there is a definite upper bound. My goal with this isn't really to predict, but to find the most important links between multiple systemic levels. This allows for more creative explanatory power when trying to construct a story for why things happen. For some reason, I find it compelling to thoroughly understand history and this requires an acute ability to talk about human cognition. There are plenty of historical explanations out there that ignore cognition and focus on behavior, but I always feel that they are lacking. In the end, I just want an enduring project to work on so that I do not get bored. By using visual aids, I am extending my ability to sort through many possible explanations in a time-efficient manner. I do not think that any of this helps with AI. General AI requires an embodiment that learns in a specific territory(*). I think the problem is much bigger than having the correct software. AI will probably not matter after the next 50 years or so. I figure I can spend roughly half my time preparing for the next 75 years, and my remaining time can be spent trying to interpolate the last 5000. (*) I think "general" AI is a misnomer. No agent has truly general knowledge. Any agent is a product of its environment.